I was exploring the old Chinese section of Hue, riding a bike down little alleyways and through neighborhoods, seeing many hidden pagodas. 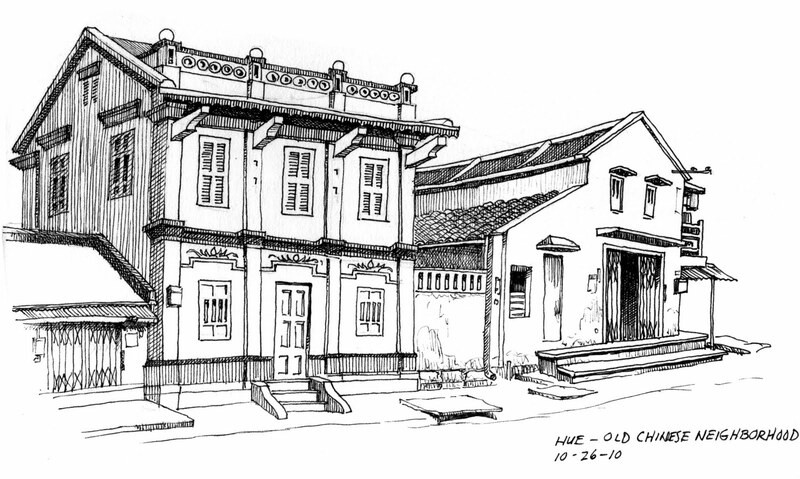 I stopped to sketch this scene, thinking it looked Chinese, but later determining it looked more French colonial. I sat on a step off the sidewalk until a lady came out of her house slapping her hand on a table, indicating I was welcome to sit at her patio table. A little while later a woman brought me a glass of ice water from her store across the street. Very much appreciated! As I sketched out the houses, people came and went, checking out what I was doing and expressing their gratitude. I've learned on this trip that showing people what I am drawing is a nice way to share with them. People are always appreciative and touched that I am drawing things in their neighborhood, which I feel creates a shared bond. I absolutely love the scenes I sketch, and they seem to appreciate another's appreciation of their own surroundings. So we can share an appreciation without a common language. A very rewarding experience.